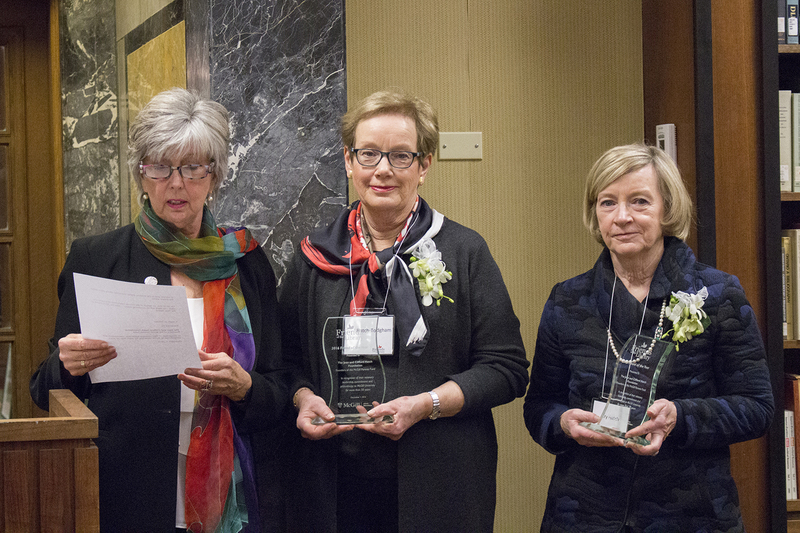 On December 1st, 2016, The Joan and Clifford Hatch Foundation was presented with the Friends of the McGill Library’s Friend of the Year award at their Annual General Meeting. 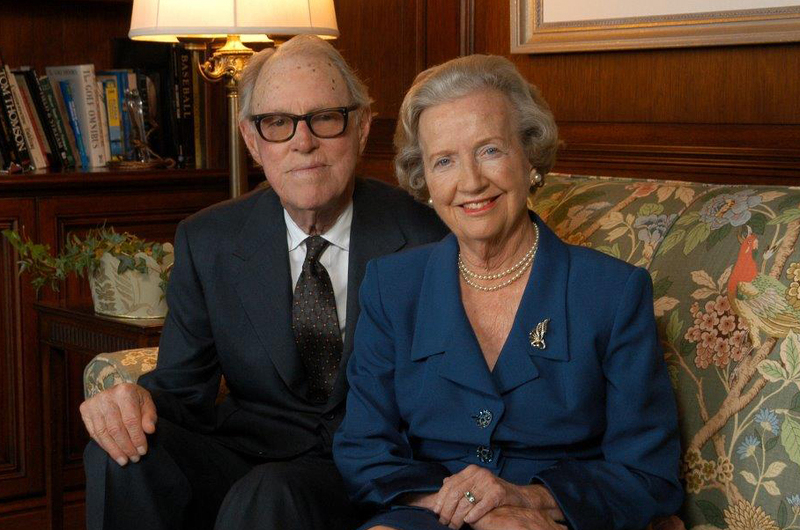 The foundation was named for an extraordinary couple who, counting 7 McGill graduates among their children and grandchildren, initiated parents’ giving at McGill more than 50 years ago by establishing the McGill Parents’ Fund in 1963. The Hatch children carry on their inspired philanthropy with this Foundation and continue to be great supporters of McGill. Now we come to my favourite part of the evening when we present our Friend of the Year Award. 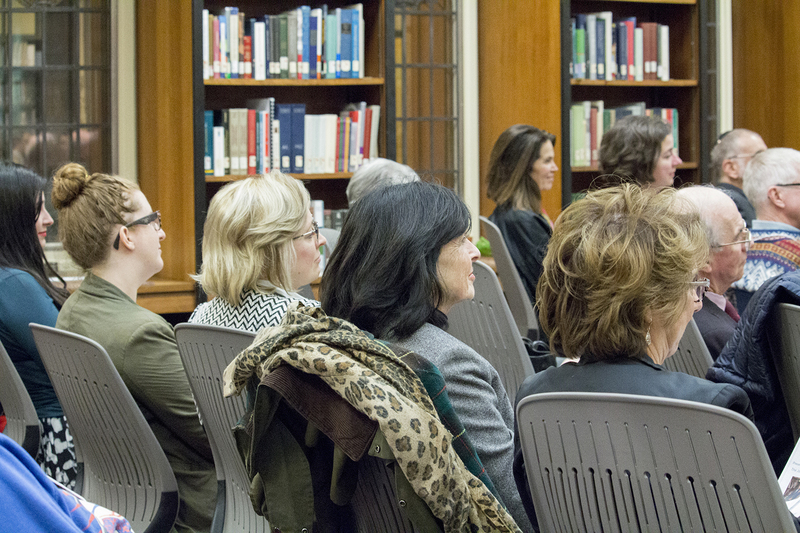 This is when we get to recognize and thank a special person, group or organization that has supported McGill’s Library in meaningful ways over the years. When the name of this year’s recipient was suggested to me this past summer, I was stopped in my tracks. For not only did I think they were unbelievably deserving, but I had known these people almost my entire life! How serendipitous that I, as Chair of the Friends, should get to present this special award to people who are so very special, not only to the McGill Library, but to me! In the name of full disclosure, I must tell you that I met Gail, Mary and their brother Clifford Hatch at camp in Algonquin Park when I was 11, a most formative time of life. We, and subsequently their family, become life-long friends. So tonight is a wonderful moment indeed. Therefore I have to admit that I could not be more thrilled than I am to be presenting this year’s Friend of the Year Award to the Joan and Clifford Hatch Foundation, named after an extraordinary couple from Windsor, Ontario. But let’s go back for a minute to Clifford and Joan’s earlier days in Windsor and their commitment to community and education. Clifford Hatch joined Hiram Walker and Sons in 1937, known as Gooderham and Worts in Windsor. After serving with the Royal Canadian Navy in WWII, he returned to the company and served as President and CEO from 1964 to 1981. He was among the community leaders who pressed the Ontario government of Premier John Robarts at the time to create a public university in Windsor more than 40 years ago. A founding chairman of the Greater Windsor Community Foundation, he served on the boards of Assumption University and the University of Windsor, assisting with three public university campaigns. He also co-chaired the Windsor area Red Feather campaign, which became the United Way. In June 1991, H. Clifford Hatch received a Doctor of Humanities degree from the University of Windsor. Joan Hatch dedicated her time and energy – in addition to raising 4 children – to causes in education, arts and the environment including the Art Gallery of Windsor, the Stratford Festival, and the shoreline stabilization project in Windsor, creating the Joan and Clifford Hatch Wildflower Garden. She was also an inaugural member of the Ontario Council for the Arts. So how did such a community and philanthropically active couple from south-western Ontario become so intricately involved with McGill University? Neither Joan nor Clifford went to McGill. In fact, Clifford did not go to university, but he did believe in the value of quality education. And so his first child Clifford Junior came to McGill in the early 60s, followed soon after by daughters Gail, then Mary, then son Rick. In later years three grandchildren, Diane, Cliff III and Aurelie also became McGill graduates. Now that’s family loyalty. And with this loyalty of children attending McGill, came a belief that they as parents should support the institution, which they did. And I suspect there was much courting of the Hatch family by the wonderful Mr. McGill of the time, D. Lorne Gales, who used to travel around the country visiting alumni and parents with E.P. Taylor in his personal plane. Gail and Mary can tell us about that later! But not only did the Hatches make lasing contributions to the McGill community themselves, they created opportunities for other parents to do the same. They led by example. Joan and Clifford Hatch understood early on that the McGill Library is at the heart of the university, a source of inspiration, a place for learning and interacting with others and a means of building community. The Hatch story emerges as an inspiring one of extraordinary initiative, leadership and generosity. Joan and Clifford Hatch pioneered the way for McGill parents to support this institution by establishing the McGill Parents Fund in 1963. This was a visionary program – the first such one, not only at McGill, but at any Canadian university at the time – which has been instrumental in raising gifts through annual giving to support the collections and resources of the McGill Library for 53 years and counting! The legacy of these proud McGill parents lives on through the Joan and Clifford Hatch Foundation, which continues to support a broad range of causes including mental health and advanced research, hospitals and universities, performing and visual arts, human rights, community and conservation organizations. We are very honoured to have with us this evening representing the Foundation, Joan and Clifford’s daughters and my friends, Gail Hatch Todgham and Mary Hatch. Over the years the Foundation has continued to support the Library by establishing a generous endowment to support the Library’s collections in Shakespeare Studies in honor of Joan Hatch who had a great love of theatre and a special love of Shakespeare. More recently Gail and Mary have taken an interest in library technology and the Foundation generously supported the library’s new Colgate Room located in Rare Books and Special Collections. 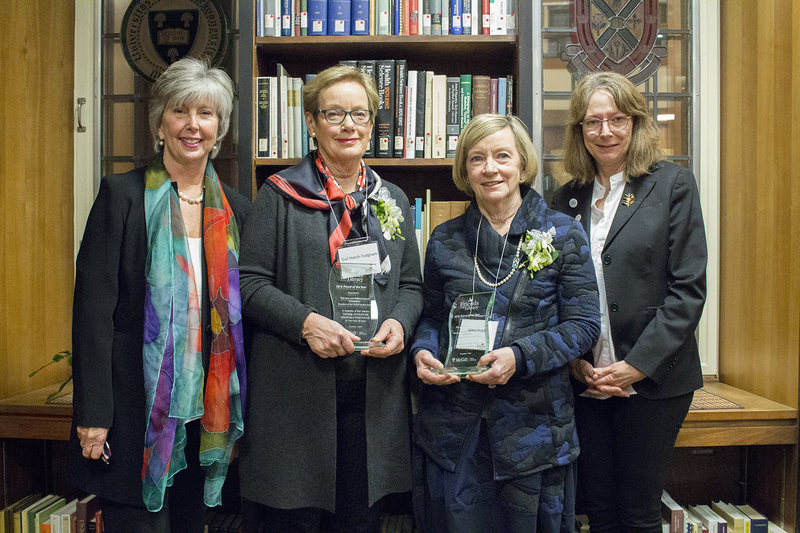 For over 50 years the Hatch commitment to the McGill Library has been exemplary and the Library would not be where it is today without its leadership. The Library is extremely fortunate to have had the ongoing support of a remarkable family whom we call our friends. You have given the Library not only philanthropic support but have inspired us with your continued faith in the role of libraries in society and in the exciting digital revolution taking place within the library world. For all of this, on behalf of the Friends I am delighted to present you both, Gail and Mary, – so there will be no sibling rivalry – with the 2016 Friend of the Year Award.